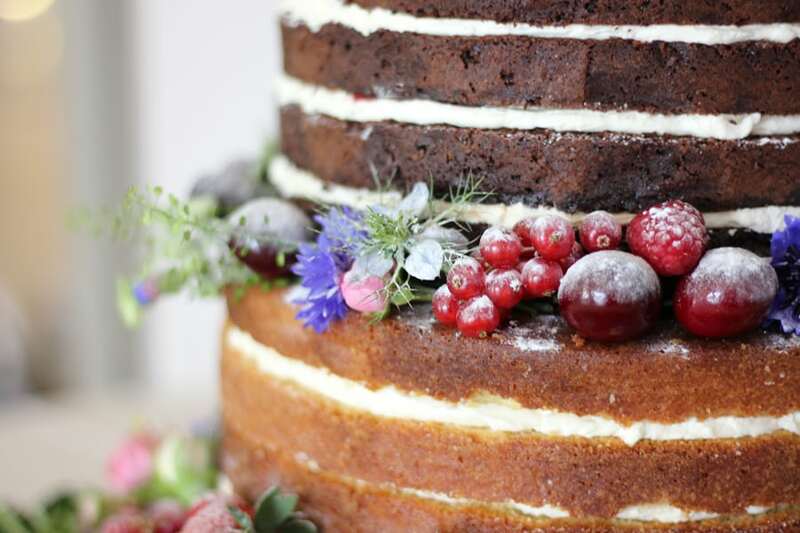 Since promoting the fact that we make naked wedding Cake here at Sticky Fingers Cake Co. I’ve come across a few couples who are really tempted by the scrummy, gooeyness of the idea but are worried about the cake drying out before it’s served. Never fear! I did lots of experiments, baked copious amounts of cakes (and put on about a stone in the process!) so that I was ABSOLUTELY sure we were able to go ahead and promote. The fact is, the cake is freshly baked the day before your wedding and set up at your venue at the last minute so that when you serve it to your guests it’s as fresh as you like. Another great thing about Naked Wedding Cakes is that if you want to serve your wedding cake as the dessert it’s the perfect type of cake for that. Ask your venue to serve it with berries and cream or ice cream – wonderful!